Additive manufacturing or 3D printing, manufacturing a product layer by layer, offers a large design freedom and faster product development cycles as well as low production startup cost, on demand production and local production. In principle, any product could be made by additive manufacturing. Even food and living organic cells can be printed. We can create, design and manufacture what we want at the location we want. 3D printing will create a revolution in manufacturing, a real paradigm change. 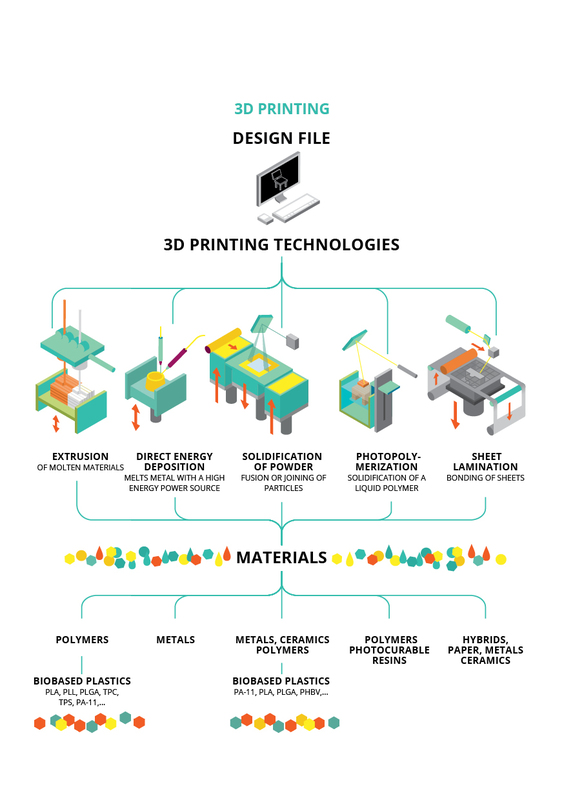 3D printing holds the promise to manufacture with less waste and energy. We can print metals, ceramics, sand, synthetic materials such as plastics, food or living cells. However, the production of plastics is nowadays based on fossil fuels. And that’s where we witness a paradigm change too. The production of these synthetic materials can be based also on biomaterials as feedstock. A wealth of new and innovative products is emerging when we combine these two paradigm changes,:3D printing and biomaterials. Moreover, the combination of 3D printing with biomaterials holds the promise to realize a truly sustainable and circular economy. This book is written by Ad van Wijk, Professor at TU Delft, the Green Village and Iris van Wijk, lecturer at the Amsterdam University of Applied Sciences The book can be downloaded for free at www.thegreenvillage.org or right here. he authors explore the promises of 3D printing with biomaterials towards a sustainable and circular economy. Amongst others they take the example of a 3D printed town house. 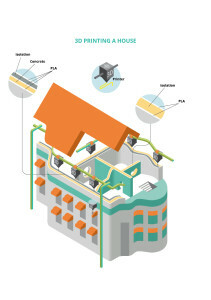 3D printing a house offers much more design freedom, more functionalities and less building waste. But if the skin of the walls, roof and floor of this house is printed from biomaterial we can save on greenhouse gas emissions too. We use PLA, Poly Lactic Acid, made from sugar beets. For this we only need the production of sugar beets from half a hectare Moreover the savings on carbon dioxide for material use are more than 60%. Met veel interesse heb ik kennis genomen van uw boek over 3D-printing met biomaterialen. Vanuit mijn functie binnen het lectoraat Duurzame Kuststoffen bij Stenden Hogeschool, ben ik betrokken bij onderzoek naar de ontwikkeling van nieuwe biobased materialen voor o.a. harsprinters. Ik zou dan ook graag een kopie van uw boek willen aanschaffen. Graag hoor ik van u of dit mogelijk is.